Bowen Lodge Fishing Report August 17, 2018 “Cautiously Thrilled” By Preliminary Lake Winnibigoshish Fisheries Reports! The term “year class” refers to walleye recruitment; the spawning, hatching and survival of young walleyes that go on to survive as catchable fish. Year class strength varies from year to year and that’s why we experience “ups and downs” in the overall population of mature fish. During mid-summer, DNR Fisheries Staff conducts tests by establishing 6 separate locations where small, young of the year fish are captured by seines, fishing nets that hang vertically in the water with floats at the top and weights at the bottom edge. The ends of the nets are drawn together to encircle the fish, which are then identified and counted. The objective of the annual study is to monitor changes in the lakes species composition and measure growth rates of both young of the year perch and walleye. Fisheries staff conducts two separate “seine pulls” at each location, timed one week apart. The timing is important because once hatched; tiny fish immediately go to the surface as they are attracted to light. It doesn’t take long before the wind distributes the small fish around the edges of the lake. As walleye age, they begin to leave the shoreline, moving toward deeper water. In fact, during this 2018 assessment, fisheries staff captured 80% more walleyes during the 1st week than they did during the 2nd week. Thankfully, we were invited to volunteer, joining the crew as they conducted this year’s assessment. Not only did we see amazing numbers of young walleye firsthand, but it was amazing to see how many other species of fish coexisted in the shallow water. There were 16 separate species of fish identified in one haul, including everything from minnows to muskies. 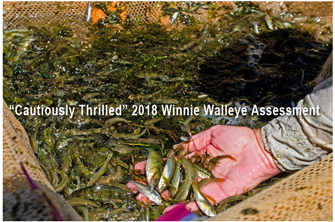 For walleye anglers, the highlight of this assessment are twofold; young of the year walleye were counted at incredibly high numbers and the growth rate of the fingerlings is phenomenal. The highest individual “seine pull” was 400 young of the year walleye. At 4 stations, 8 “seine pulls” combined to produce more than 700 young of the year walleye. Even better news than the high catch rate was the growth rate of these young walleye. At the time of the testing, their length averaged 4 inches, also phenomenal for that early in the summer and it is this robust growth rate that may be the help needed to put this year class off the charts. That’s because winter survival is crucial to producing a strong year class, the larger the fish grow before the lake freezes, the better their chances of survival will be. Nobody can predict the future, and we’re not trying to. But at this point it is definitely fair to say that we, along with DNR Fisheries Staff are “Cautiously Thrilled” with these 2018 preliminary population assessment results.